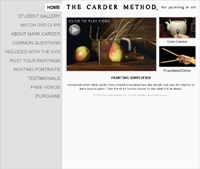 The Carder Method for Painting in Oil is a complete course in realistic oil painting. Mark Carder invented a device called the Color Checker that allows you to duplicate the colors you see in your still life into mixed paint on a palate. The Color Checker is shaped like a pair of tweezers with one end flat and the other round with a hole in. The flat end can be seen when you look through the hole, covering the lower semi circle. The idea is to point the device at your subject so that you can see it through the top semicircle of the hole, and try dabbing paint onto the flat end until it matches the color of the subject that you see through the hole. The Proportional Divider is a wooden calliper designed to make the drawing part easier. Carder claims that you do not need any natural drawing ability or knowledge of mathematics to create an accurate drawing if you use this device. With the small end of the proportional divider you measure the proportion of the part you want to draw. Then you flip the divider over and the large end shows you where to place the points you just measured onto the canvas. After you have plotted enough points, you simply connect the dots. Once the beginner has used these tools for a while, they should no longer need them as they should have been taught to see paint like a trained artist. Carder claims that even experienced artists can gain improvement from using these tools. A suggested 8 hours a week is needed to learn to paint this way, working in a series of short 30-45 minute sessions. A still life will take about 3 to 4 weeks to complete, but this will vary depending on the person. The course comes in 6 hours of DVD instruction. The Color Checker and Proportional Divider cost extra, making an overall cost of $178.90. This is quite an expensive course to buy, being that it is only one specific method of painting and does not cover other aspects of painting or provide supporting texts for further study. What your money is paying for is essentially a gimmick, an idea, so in terms of value for money this is not great. However, from looking at the student gallery on TheCarderMethod.com the results are quite impressive. What appears to happen is a camera obscura effect - by identifying and emulating a small area of light you can re-create reality as seen through the human eye onto the page. The DVD presentation is clear, precise and easy to use. The website of a product is always a good indicator of the product, and TheCarderMethod.com is clean, uncluttered, inviting, and denotes quality and professionalism. Some materials are provided with the DVD to get you started, such as the color wheel, color mixing reference card and a sample color card for staining your canvas. Also you will be able to access the online forum once you have made your purchase, and communicate with other students using the Carder Method. This is a great bonus, as is helps to have access to an online community for home learning. If you are looking for a quick effective technical way to tackle the sometimes tricky medium of oil painting, this may well be the course for you.